Europe was once again ranked the most peaceful region in the world. The largest improvement since last year occurred in Central America and the Caribbean, while South America also made progress in its levels of peacefulness. MENA had the largest decline, followed by Sub-Saharan Africa, Europe and Asia Pacific respectively. [pullquote]Syria is least peaceful, followed by South Sudan, Iraq, Afghanistan and Somalia. [/pullquote]The tenth edition of the Global Peace Index highlights a stark and growing inequality in global levels of peacefulness as the gap between the most and least peaceful countries continues to widen. The study, by international thinktank the Institute for Economics and Peace, finds that, while 81 countries improved, the deterioration in another 79 outweighed these gains, meaning that peace declined at a faster rate than in the previous year. 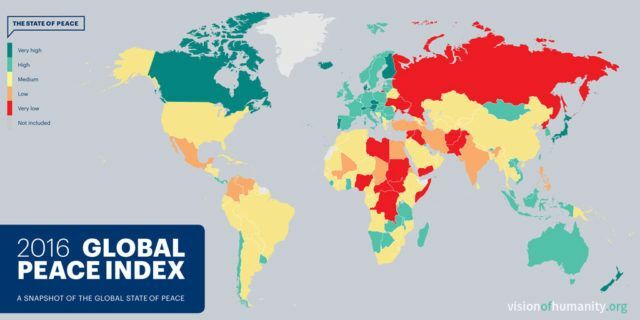 Despite this some of the most peaceful countries are now recording historically high levels of peace. The score for the Middle East and Africa (MENA), the least peaceful region in the world in last year’s report, dropped further as regional conflicts intensified, dragging down global peacefulness. So intense is the current concentration of violence and conflict in MENA that, when considered separately, the rest of the world’s average peace levels improved. Three of the five biggest declines in peace occurred in the region including Yemen, Libya and Bahrain. The global deterioration in peace in 2015 was driven by increased terrorism and higher levels of political instability. While the majority of terrorist activity is highly concentrated in five countries – Syria, Iraq, Nigeria, Afghanistan and Pakistan – the breadth of terrorism is spreading, with only 23% of countries in the Index not experiencing a terrorist incident. Europe, which was once again the most peaceful region in the world, saw its average score deteriorate in this year’s report in the wake of terrorism incidents in Paris and Brussels, with deaths from terrorism in Europe having more than doubled over the last five years. The number of refugees and displaced persons has risen dramatically over the last decade, doubling to approximately 60 million people between 2007 and 2016, nearly 1% of the world’s population. There are now nine countries with more than 10% of their population displaced in some form; 20% of Somalia and South Sudan’s population respectively, and over 60% of Syria’s. While the global economic impact of violence dropped by 2% when compared to last year’s report, it was still a staggering $13.6 trillion in 2015, equivalent to 11 times the size of global foreign direct investment. This represents 13.3% of world GDP, or $1,876 per person. In the last ten years the economic impact of violence was $137 trillion; greater than global GDP in 2015.ext block. Click edit button to change this text. 1. Europe accounts for six of the top seven places in the rankings with Iceland, Denmark and Austria remaining the highest-ranking countries. Portugal built on last year’s gains to rise nine places to fifth globally. However, the average score in Europe deteriorated, reflecting increases in the impact of terrorism as well as the escalation of violence and instability in Turkey and the country’s deteriorating relations with its neighbours. 2. North America’s score remains in line with GPI 2015. A small deterioration in Canada, due to an increase in weapons imports and exports, was offset by a comparable improvement in the US. 3. Asia-Pacific’s level of peace has remained largely unchanged since 2015, however a number of countries including Indonesia, Timor-Leste, Myanmar and Thailand improved their scores. Heightened tensions in the South China Sea impacted external relations between the three main nations concerned; China, Vietnam and the Philippines. 4. Despite continuing security issues in Central America and the Caribbean, the region’s score improved sufficiently for it to move above South America in the rankings, and into fourth place overall. Improvements were recorded particularly in the levels of political instability and political terror. The best performer was Costa Rica, characterised by its low levels of militarisation. 5. South America dropped in rank in light of the substantial improvements in Central America and the Caribbean but still recorded an improvement in its overall score since 2015. This was due to lower levels of international conflict and militarisation underpinned by largely peaceful relations between neighbouring countries. However, there was significant social unrest in Venezuela and Brazil. Political instability increased in Brazil just months before the start of the 2016 Olympic Games in Rio de Janeiro. 6. Sub-Saharan Africa’s average deterioration masks sharp variations in country performance: Chad, Mauritania and Niger all improved their relations with neighbouring countries, while the threat posed by Islamist terrorist groups continues to weigh on many countries in the Sahel and West African region. 7. Russia and Eurasia remains the third least peaceful region. The biggest improvements were in Belarus, Kazakhstan and Uzbekistan; the largest deteriorations were in Ukraine, due to the persistent conflict with pro-Russian separatist forces in the Donbass region. 8. South Asia remains the second least peaceful region. Afghanistan, Nepal, Bangladesh and India deteriorated; while Bhutan, Sri Lanka and Pakistan improved modestly. Internal security concerns were heightened in Bangladesh and Nepal owing to anti-government protests. Afghanistan has seen a resurgence of violence in the last year, with a number of clashes between government and Taliban forces, and the possible re-emergence of Al-Qaeda after the withdrawal of coalition forces in 2014. 9. MENA, which was already ranked the lowest in the 2015 GPI, had the biggest deterioration in peace this year, as the civil wars in Syria and Yemen deepened and led to increased external intervention. Yemen, whose long-standing political crisis exploded into outright civil war in early 2015, witnessed a large slump, driven by the rising casuality rate, a large increase in the number of refugees and internally displaced people, and higher levels of terrorist attacks by both al-Qaeda and ISIL.